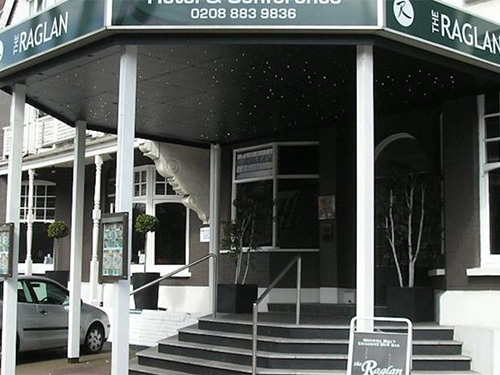 The Raglan Hall Hotel is situated in an elegant, quiet tree-lined avenue in north London. We are close to the major road and rail networks. You will be pleasantly surprised by the size of the 48 light and well-appointed bedrooms in the comfortable, three star Raglan Hall Hotel. There are also many other amenities in this friendly yet professional environment, conveniently situated in the heart of North London's cosmopolitan Muswell Hill. Raglan Hall can offer a wide range of services including magnificent conference and banqueting facilities in the newly refurbished Garden and Raglan Suites. Whether you are organising a wedding reception or a corporate gathering, we will take care of everything down to the smallest detail. Furthermore, Raglan Hall has a partnership with nearby amenities such as Muswell Hill golf course and can arrange for guests to be involved in many other local activities. At Raglan Hall Hotel, we offer two very special bonuses: our own secluded private garden (with a relaxing patio area) and Flutes, an elegant, air-conditioned restaurant recognised for its imaginative, modern British food, attentive service and lively Sunday jazz brunches. Whatever your needs, Raglan Hall has the answer. From spacious family rooms to well-proportioned doubles and characteristic singles, all bedrooms are comprehensively equipped to include LCD televisions with Sky and free movies, a hairdryer, iron and tea or coffee-making facilities. WiFi and hardwired broadband access are also available in each room. All this, coupled with only the highest quality furnishings and fittings, make the Raglan Hall a place you can really feel at home in. Situated within Raglan Hall Hotel, Flutes restaurant offers the best of prime seasonal produce selected from Covent Garden Market, Smithfield and Billingsgate. The menu changes on a regular basis to ensure that regulars and first-timers are always able to find something to their taste, from a prime veal or beef steak, fresh fish and seafood platters to simply-cooked pasta dishes. Flutes has received rave reviews and is now considered as a West-End standard restaurant, right on your door step in Muswell Hill. This together with the unbeatable ambiance, class and value for money, make Flutes the jewel in the Raglan Hall crown - we guarantee you will not be disappointed. CHECK IN TIME IS AT 3PM AND CHECK OUT TIME IS AT 11AM. PAYMENT PROCEDURE IN CASE OF NO SHOW: PLEASE NOTE THAT IN CASE OF NON ARRIVAL, THE HOTEL WILL CHARGE YOUR CREDIT CARD USING THE DETAILS GIVEN AT THE TIME OF BOOKING. In the event of a no show or a cancellation with less than 2 day notice prior to the date of arrival, an amount equivalent to one nights average cost of accomodation will be charged. Your credit card number guarantees your reservation for late arrival - on check-in we require the card to check and charge your card on departure. Non arrival - a charge equivalent to one night's stay will be levied for all non arrivals. The hotel regrets that we cannot accept Visa Electron as a method of guarantee. All of the hotel's bedrooms have en-suite facilities and a wealth of additional extras. Family rooms consist of a double bed and a single bed and can accommodate up to 4 people. If an extra bed is needed, a 20 GBP charge (per night) will be incurred by the guest. Why not try the hotel's new Flutes restaurant, now open for dinner (open Tuesday-Saturday). The menus change every week. Starter: Crispy duck spring rolls with sweet soy and chilli dressing. Carpaccio of Scottish beef with rocket and Parmesan. Roasted vegetables topped with grilled goats cheese on pesto crostini. Main Course: Sauteed calf's liver on buttery mash with spinach, crispy onion rings and red wine jus. Seared loin of yellow fin tuna, rocket and asparagus salad and chilli. Scottish rib-eye steak, fat cut chips, slow roasted tomato, herb butter. Dessert: Peanut butter and chocolate cheesecake. Rhubarb and vanilla crumble, creme anglaise. Brioche bread and butter pudding served with Bailey's cream. From either direction turn off the North Circular Road at the junction signposted for Muswell Hill on the B550 (Colney Hatch Lane). Follow this road for 1 mile until it merges with the roundabout at Muswell Hill Broadway. Take the last exit off the roundabout onto Queens Avenue. The hotel is 75 yards further along on the right-hand side. The nearest Tube station is East Finchley on the Northern Line (High Barnet Branch). 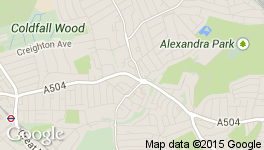 The station is 1 mile away (15 minutes walk along Fortis Green Road). Bus route 134 stops at Muswell Hill Broadway via Highgate, Archway, Camden Town, Warren Street and Tottenham Court Road. Bus route 43 stops at Muswell Hill Broadway via Highgate, Archway, Islington, Bank and London Bridge.